Dr. Phillip Hertzman is a Board Certified Phlebologist and Board Certified Family Physician with a special interest in Phlebology practicing in Los Alamos, Santa Fe, and Northern New Mexico for 30 years. He is a graduate of Washington University School of Medicine in St. Louis, Missouri. He is a Clinical Associate Professor at the University of New Mexico School of Medicine. He is a Fellow of the American College of Physicians, the American College of Phlebology, and the American Academy of Family Physicians. He is also a member of the American College of Rheumatology and the American Venous Forum. He has served as a faculty member and lecturer, and has presented numerous scientific papers related to Venous disease at many National and international Medical meetings. Recent research projects include new treatments of venous disease and of venous ulcers. He has published an article on the treatment of patients with venous ulcers in the international journal Phlebology. He is currently a Principal Investigator in an FDA phase 3 study of treatment of varicose veins. He has traveled to Honduras and to Mexico on humanitarian missions to treat patients with severe venous disease. Dr. Hertzman is a member of the American College of Phlebology Committee on International Affairs and Committee on Preceptorships. He is a National Preceptor for the American College of Phlebology. He was one of the physicians who first recognized and reported the Eosinophilia Myalgia Syndrome (EMS) linked to the use of L-tryptophan. Since 1989 he has been involved in the clinical investigation of this syndrome. He has coordinated a number of national and international conferences and projects related to the investigation of EMS, the dissemination of information regarding EMS, and the comparison of EMS to the Spanish Toxic Oil Syndrome. 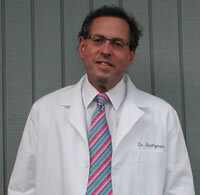 Dr. Hertzman has published several book chapters and numerous articles on topics including venous disease, hypertension, exercise stress testing, and the Eosinophilia myalgia syndrome in well-known peer-reviewed medical journals including the New England Journal of Medicine, Annals of Internal Medicine, JAMA, Journal of the American Board of Family Practice, American Family Physician, The Journal of Hypertension, Phlebology, and Journal of Rheumatology. He also reviews manuscripts for several prominent medical journals. Between 1999 and 2003 he was the Medical Director of the Los Alamos - Sarov Medical Partnership supported by the American International Health Alliance and USAID. As part of this recently concluded project he has developed models for delivery of care for asthma, hypertension, women’s wellness, and diabetes in Sarov, Russia.